Worldwide approvals: UL (UL508), c-UL, TUV, and CE (both LVD and EMC). Models available with UL 1604 and UL13010 approvals for hazardous locations. Single-phase AC input (100 to 240VAC). Three-phase AC input (320 to 575VAC). DC compatible input for single-phase models (110 to 350V). Compact models available 70% smaller than conventional power supplies. 73W and 145W models available for AS-Interface power supply. Control Components is pleased to offer you the full line of IDEC power supplies. If you have any questions regarding IDEC power supplies please don’t hesitate to contact us. 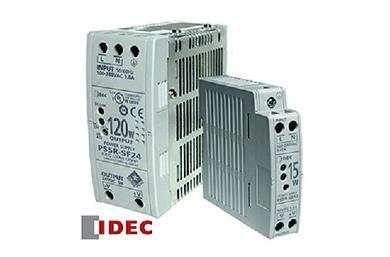 Please click the link below if you’d like more information on IDEC’s line of power supplies.